A zoomed-in look at the massive Valentine's Day solar eruption, taken by NASA's Solar Dynamics Observatory in ultraviolet light. Much of the vertical line in the image is caused by the bright flash overwhelming the SDO imager. As dramatic as it was, the massive solar eruption on Valentine's Day didn't send astronauts aboard the International Space Station scurrying for cover. In fact, oddly, it probably helped lower their overall radiation dose. Monday's solar storm — the most powerful one in more than four years — sent huge waves of radiation and fast-moving particles streaming toward Earth. The sun has stayed active since, with another big flare erupting today (Feb. 18). But while the most intense solar storms can put astronauts at risk, the space station's shielding and Earth's magnetic field generally protect against such events pretty well, experts said. And the Valentine's Day eruption should actually provide a health benefit for spaceflyers, sweeping away some of the dangerous, ultra-high-energy cosmic rays rocketing in from beyond the solar system. "It actually makes the crew doses decrease rather than increase," said Frank Cucinotta, chief scientist for NASA's Space Radiation Program at the Johnson Space Center in Houston. "The galactic cosmic rays are a bigger concern to us." The Valentine's Day solar storm unleashed a Class X solar flare — the most powerful kind — that blasted X-rays and other wavelengths of light toward Earth. It also threw off a massive cloud of charged particles and knots of magnetic field, in an event known as a coronal mass ejection (CME). But the space station is nowhere near the moon. The orbiting lab sits just 220 miles (354 kilometers) above Earth — still cocooned within the planet's protective magnetic field. And the station protects well against most solar storms, Cucinotta said. So as long as astronauts stay inside, they should be fine. "Any region on the space station is pretty heavily shielded," Cucinotta told SPACE.com. "But EVAs [extravehicular activity], if you don't time them right, could be a problem." That's not to suggest that astronauts aboard the station are invulnerable, as truly immense eruptions can generate some concern. Back in 2003, for example, a massive solar storm impelled spaceflyers to take cover in the most heavily shielded part of the orbiting lab. But Monday's event did not merit such action, Cucinotta said, and in general the station provides good protection. The space shuttle has good radiation shielding, too, so the recent eruption shouldn't present any problems for Discovery's upcoming launch, slated for Feb. 24. 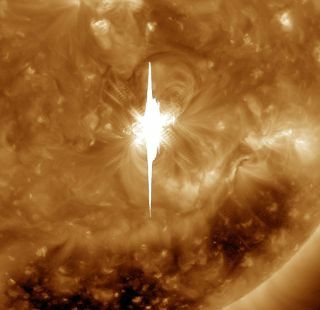 Instead of posing a danger to astronauts, Monday's big solar storm should actually help them out by clearing away some of the cosmic rays that shower the station constantly, Cucinotta said. Cosmic rays are primarily high-energy protons spawned by supernova shock waves and other dramatic events throughout the universe. They're constantly flooding into our cosmic neighborhood from afar, and they're a lot tougher to stop than solar protons. Earth's atmosphere attenuates cosmic rays, so astronauts receive a higher radiation dose than folks on the ground do. The fast-moving particles can penetrate flesh, slamming into cells and damaging DNA. Over time, high exposure can potentially cause cancer and other health problems. But powerful solar storms like the one unleashed on Monday can reduce that exposure, Cucinotta said. Magnetic fields deflect charged particles, so when a CME barrels toward Earth, it sweeps away many of the cosmic rays in its path. This phenomenon, known as the "Forbush decrease" after the scientist who discovered it, has been observed repeatedly. The effect can be dramatic and sustained. During one spate of solar storms in 2005, for example, cosmic-ray exposure on the space station decreased by 30 percent, NASA officials have said. So while big solar storms can be destructive — disrupting power and communications infrastructure around the world — their massive power can also do some good, creating a protective bubble around astronauts floating hundreds of miles above Earth. CMEs can create spectacular auroras — the light shows visible near Earth's poles — as well, and that's nothing to sneeze at, either. You can follow SPACE.com senior writer Mike Wall on Twitter: @michaeldwall.